I would probably say that I first got in to future bass when I first heard Zedd’s song Candy Man. Future bass is a type of music that brings a lot of freedom when it comes to producing, which is important to me, I like variation. 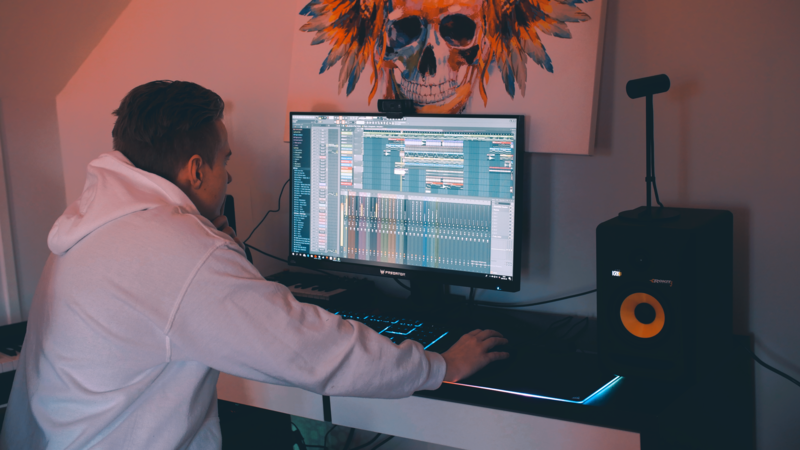 You can make two different types of future bass songs and still make them sound completely different! “Clauz” is a very unique producer name, how did you choose that name? Any special meaning behind it? My middle name is Claus, so you know to make it more “interesting” I decided to make Clauz my artist name. My grandfather is from Germany which is where I got my name Claus from. He meant a lot to me, and unfortunately, he passed away before I really got to know him, therefore I decided Clauz would be a great name to honor him in a weird way. Tough question, I like Brazilian bass a lot, and also 80s music, and like I mentioned before future bass, that’s probably because I want to keep it varied, I feel like I learn a lot from producing different types of music. Your latest track “City” is your best track in our opinion! From its artwork to the Incredibly powerful sound we absolutely love it. Could you tell us more about the story behind this track? Also what is your creative processes like? Thank you! City is a special song to me, it was after school one Friday I believe, I had some spare time on my hands and decided to make a purely future bass based song. I messed around with some weird melodies which I really liked and after a couple of days the song was finished. I missed a whole weekend of study though, worth it. My creative process is rather spontaneous, I have a lot of schoolwork, so sometimes I have to prioritize. I feel like I am highly creative if I’m sad or really stressed out, making music then becomes like therapy. I usually finish the entire song all between 6-15 hours I would say, it really depends on what mood I’m in. Hahaha, actually my biggest dream is to produce movie music, it’s kind of a weird dream, but I love creating songs while watching a picture. It could be a picture of anything really, and creating music to that picture is almost like writing a story. Yes! Sad news actually, I’ve been drafted in for the military, and I will be serving for 11 months. However, when I’m done I will produce like crazy, and I will probably try to get some gigs as well.